The Papshund is a hybrid dog, also known as a designer dog. 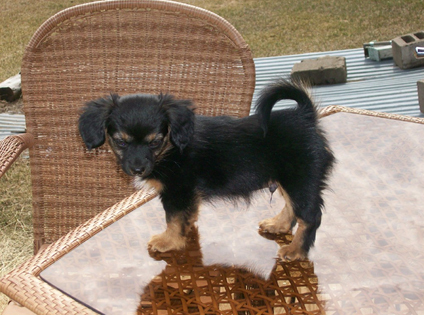 The Papshund is a cross between the Dachshund and the Papillon. It is not always possible to determine the characteristics, temperament or traits of a mixed breed. You will likely find the Papshund has a combination of the characteristics found in both the Dachshund and the Papillon. This is Billy the papshund. He’s about 2 months old here and weighs about 3 1/2 pounds. 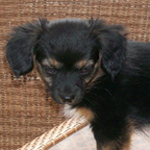 He has the Papillon face and body shape, but the dachshund coloring except for on his chest, he has some white there mixed with brown and black. He’s pretty energetic! He’s also smart. I rescued an adult Papshund and been wondering what she looked like as a puppy and yours looks exactly like what I think she would have looked like. Just curious what he looks like now. Could you send me a picture? ?